Topher Ltd., the security and traffic management specialist based in Fleet, Hampshire, has announced that its traffic marshals have been awarded regional Community Safety Accreditation Scheme(CSAS) powers by two further police forces, Dorset Police and the Metropolitan police.To be awarded CSAS accreditation, Topher employees have to undertake specialist training from the police, and pass a test. The CSAS powers are normally awarded on a county by county basis, but this South West Region accreditation permits Topher’s eight accredited marshals to manage traffic on public highways in Avon & Somerset, Devon,Cornwall, Dorset, Gloucestershire and Wiltshire. 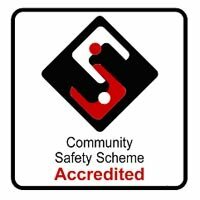 CSAS accreditation from the Metropolitan Police permits Topher’s marshals to do the same on all roads in Greater London. The CSAS powers give accredited marshals the authority to stop traffic on the public highway and even close public roads if deemed necessary. Topher’s first CSAS accreditations were awarded by Hampshire constabulary in March 2014. Its marshals have since been CSAS accredited by both Essex and Dorset constabularies for their own counties, and now Greater London and the whole South West region too.